Manchester City academy winger D'Margio Wright-Phillips has stepped up into the club's first team training sessions once again this season, ahead of the second leg of the club's Carabao Cup semi final against Burton Albion. Pep Guardiola's side are coming into their match at the Pirelli Stadium with an astonishing 9-0 aggregate scoreline in their favour, something which will allow for a lot of rotation on Wednesday evening. One player who could be in line for a debut is self-confessed Manchester City fan Wright-Phillips. 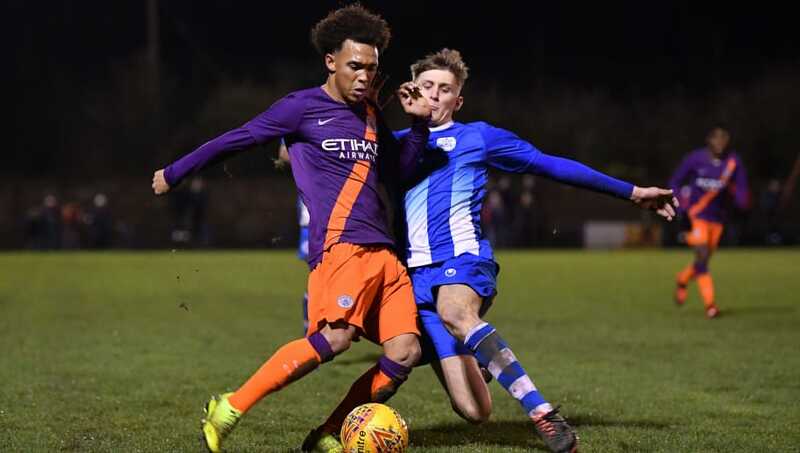 The 17-year-old, who is the son of former City star Shaun and therefore grandson of Ian Wright, has been making a name for himself in the Under-18 Premier League this season and is being rewarded for his efforts by training with their first team. A picture that has been shared on social media shows the youngster embracing Raheem Sterling at the start of a training session, which could hint that Wright-Phillips is in line to feature for Manchester City against Burton Albion on Wednesday. City also have a FA Cup game against Burnley just around the corner, so Guardiola will once again rest players as their first three games next month are against Arsenal and Chelsea in the Premier League before travelling to Schalke 04 in the Champions League knockout stages. Wright-Phillips has spent six years working through the ranks at Manchester City. He's impressed at every level so far in his young career, but this season he's starting to make a name for himself as a creative winger. In 12 league appearances this season, Wright-Phillips has claimed eight assists and he's also scored twice, both goals coming in 6-0 wins against Newcastle United and Derby County.